My lovely sister is helping me out here while I'm being lazy working on expanding my repertoire. Here's a mouth-watering recipe that she sent along. 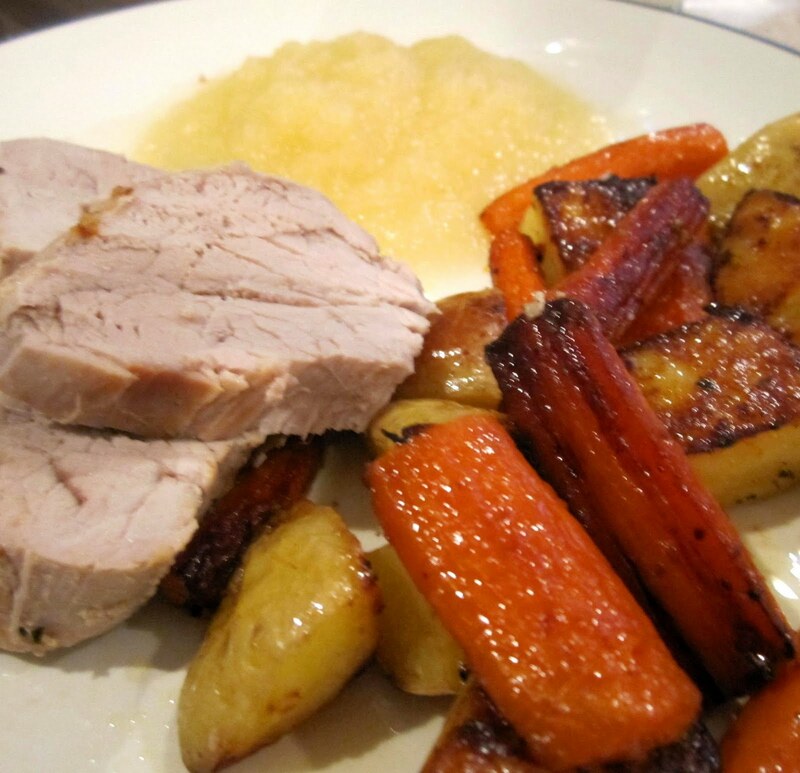 In her words: One of my favorite easy comfort meals, especially in the winter, is pork tenderloin roasted with carrots and potatoes. 1) Peel carrots and wash potatoes and chop both into approximately bite-sized chunks. I like to use the potatoes I noted above because the skin is thin enough that I don't mind eating it and therefore can avoid peeling, but if you wish you can also peel the potatoes. 2) Put carrot and potato pieces in a pan large enough to hold the veggies in a single layer as well as the meat. (I have the best results with a non-stick roasting pan but have also used a glass baking dish.) Add a good dash od olive oil, salt and any additional seasonings as desired- I like to add pepper, fresh or dried thyme and whole peeled cloves of garlic- and stir. Leave a space in the middle of the pan for the tenderloin. 3) Sprinkle salt and any desired herbs, over the pork tenderloin. Put the tenderloin in the pan and drizzle with olive oil and roll around to get an even coating. Note: if there is already olive oil left coating the pan from the veggies you don't need to necessarily add more. For a nice garlic flavor to the meat, make horizontal slices with a small knife and press peeled garlic gloves into the opening. (I usually add the garlic either to the veggies or the meat, but not both as it can be overpowering) Another method is to spread mustard over the meat, adding more halfway through cooking. 4) Cooking time will depend on the thickness of the meat, your oven, and whether you prefer the pork well done or pink. I usually cook this for at least 40 minutes, turning the veggies several times to ensure even cooking. You can always take the meat out early if it seems done and the veggies aren't, or vice versa. Remember that the residual heat will cook the pork a bit more after you take it out, so take it out before it seems completely done to keep it tender. I like applesauce or cranberry sauce as a garnish and a salad would also be a nice accompaniement.